Each year of his confinement represents another strike against freedom of information. This past Sunday, June 19, Julian Assange began his fifth year inside the Ecuadorian Embassy in London, where he was granted asylum from the United States in 2012. The date was marked with simultaneous worldwide events—with 60 prominent supporters, including Noam Chomsky, Ai Wei Wei, Patti Smith, and Michael Moore, demanding Assange’s release. The theme of the day was “First They Came for Assange,” an allusion to Pastor Martin Niemöller’s famous poem warning of the dangers of staying silent in the face of rising state repression. 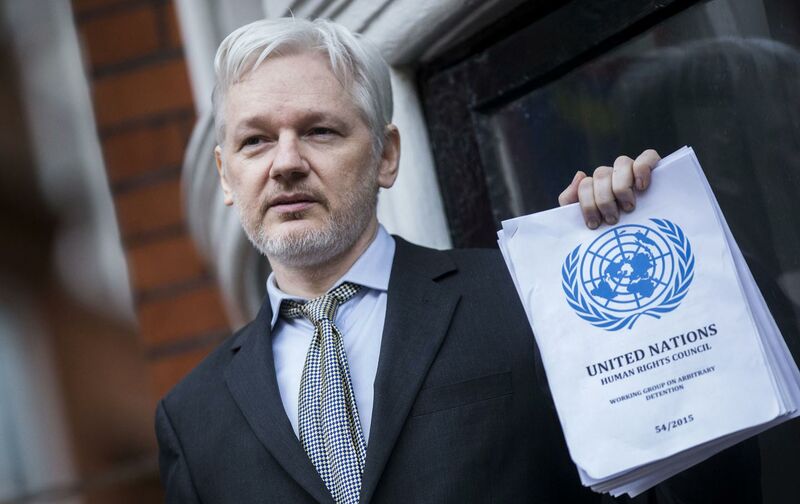 Assange’s ordeal continues despite the fact that on February 5, the United Nations’s highest authority on detention, the Working Group on Arbitrary Detention (WGAD), found that Assange was being arbitrarily and illegally detained. The WGAD held that Assange’s confinement is a result of the United Kingdom and Sweden’s failure to honor his right to asylum and fear of persecution by the US government. It is telling that Sweden and the United Kingdom refuse to respect the WGAD process—one they chose to participate in, and one they helped create. Even though the United Kingdom has since changed its law to block extraditions in cases like Assange’s, he faces extradition to Sweden, where he has not been charged with a crime—and where he would likely be given a one-way ticket to a US prison. His fate would almost certainly be a lifetime in solitary confinement. The US government has fought tooth and nail to keep every shred of paper about its WikiLeaks case secret (in 2012, the FBI file was over 42,000 pages). Both the Justice Department and FBI, for instance, have litigated to crush freedom-of-information lawsuits related to the case: one seeking to shed light on surveillance of WikiLeaks supporters, the other by alleged WikiLeaks source Chelsea Manning for the FBI file relating to her now-concluded court-martial. Nonetheless, what is known about the United States’s attempt to build a case against Assange and WikiLeaks is serious, sinister, and frightening. It includes a grand jury that was secretly impaneled in Alexandria, Virginia; invasive searches of WikiLeaks staff; surveillance of WikiLeaks supporters; and coordinated attempts to discredit, bankrupt, and destroy the publisher. So much for the First Amendment. News organizations have gotten the message the Justice Department is sending. American Civil Liberties Union Executive Director Anthony Romero has lamented the WikiLeaks investigation’s “chilling effect” on the press and cautioned that any criminal charges would be “unprecedented and unconstitutional.” Press freedom organizations around the world have warned that a case against Assange puts all journalists at serious risk. Of course, it’s not just the pending case against Assange that raises serious First Amendment problems. In recent years, federal prosecutors have pushed the boundaries of US secrecy laws to their outermost limits. President Obama has mounted an unprecedented war on whistleblowers using the notoriously vague Espionage Act of 1917, which punishes “unauthorized” disclosure of government information. The Computer Fraud and Abuse Act (CFAA) similarly punishes “unauthorized” access to information involving computers (a definition the Electronic Frontier Foundation warns is unconstitutionally vague). Both these laws—the Espionage Act and the CFAA—are cited in search warrants for WikiLeaks staff. They were also used to convict Chelsea Manning. (Last month, Manning appealed her draconian 35-year sentence, citing UN findings of inhumane treatment and the nine months she was held in solitary confinement in a six-by-eight-foot cell.) Edward Snowden, who now lives in exile in Russia, has also been charged under the Espionage Act. Both President Obama and presidential candidate Hillary Clinton have insisted that whistle-blower channels work, that the protections afforded people of conscience inside the government mean that there is no need to do as Manning and Snowden both did: turn to the media to get their information out to the public. But just last month, a top Pentagon official, John Crane, exposed the falsity of these claims. In a book and several articles by Nation correspondent Mark Hertsgaard, Crane makes clear that whistleblowers witnessing atrocities are faced with an impossible choice: stay silent, violating oaths to uphold the Constitution and the law of the land (which includes human rights treaties)—or go public, facing prison or exile. It’s worth noting that there are some government employees who are exempt from this system. Although former attorney general Eric Holder denied that the government considers “the nature of the person, the position of the person” when bringing prosecutions for leaks, the facts suggest otherwise. General David Petraeus got two years of probation after leaking top secret and code-word materials to his mistress and biographer—and, it is believed, to journalists as well. Manning, meanwhile, is serving 35 years in military prison. Nothing in her case was marked top secret. She was not allowed to say she was motivated by the public interest. Truth-tellers, in other words, get no public-interest defense under these laws, but high-ranking officials enjoy a de facto politician-interest defense. This ethically bankrupt system, which holds the government unaccountable while forcing truth-tellers into prison and exile, is not one the American people, or any people, deserve. There is no reason for a publisher like Assange and whistleblowers like Manning and Snowden to pay for this system with their liberty. Assange exposed war crimes, cover-ups, and serious abuses of state power. He pioneered a system of publication and collaboration with media and human-rights groups, inspiring journalism like the Panama Papers. News organizations try to emulate the source protection and journalistic innovations of WikiLeaks. Assange has spent over 2,022 days in confinement, wholly undeserved and a failure for democracy. It is past time for that treatment to come to an end. Carey ShenkmanCarey Shenkman (@CareyShenkman) is a First Amendment and human rights lawyer, and member of Julian Assange's legal team.